Enduro cyclocross racing – a contradiction of terms at first blush? The organizers behind last weekend’s Kettle X Enduro Cyclocross Race, put out the challenge, 74 km of off-road cyclocross racing through the Blackfoot trail system just east of Edmonton. Reading the tech guide, the projected finish time for the leaders was 3.5 hours, accounting for up to 6 hours for the rest of the field to complete the ‘Full Kettle’ course. Based on this info, a lot of folks signed up – in fact, 170 racers decided to give’r a go – as did I.
I found some confidence talking to the other members of my team, though – Ken Hurd (we think he was on our team? ), Mike Sarnecki, and Jason Redfern. Driving out to the race in Ken’s white minivan (Falkor), Ken and I chatted about things at length, neither of us really knowing what this was going to be like, but Ken sounded reasonably confident of turning in a 4 hour time, so I resolved myself to this as well. I was feeling good that morning, finally, as I was coming off the tail end of a brutal bout with the Flu just the previous weekend. The weather was also working in our favour. The morning was cool, but the sun was shining and most importantly, the course was dry! Post sign-in, a few of us spun out onto the trails to get a feel for what we had in store. It took only minutes for me to realize just how bumpy and rough it was going to be. After only a short 15 min warm-up ride, I could already feel my hands getting tired and sore from gripping the bars. I immediately dropped my tire pressure down to 30psi front / 35psi back, and wondered if the folks who showed up with MTB bikes, weren’t the smart ones. At 10 a.m., the gun went off and 170 racers, broken into 3 categories: Full-Kettle (74km), Half-Kettle(37km) and Tea Cup, rolled out in a mass start. Thinking ahead, the organizers knew well to make the 1st km a neutral start to eliminate the potential of mass carnage. Once we got going though, the pace picked up and it was suddenly all business. Thinking this was going to be the kind of race you ‘ease’ into, was a mistake. As a couple racers whooshed past me, I realized I had to get moving if I was going to stay in the mix. Ken must have come to the same conclusion at that time as well, pulling out and speeding off up ahead of me. I stayed with him for a bit, but had to let him go after a few km and settle back into my own pace. There were still 70-some odd km to go, after all. Ripping along these wide, rolling and dry trails was a seriously good time – and as it turned out, as long as you kept your speed up, the roughness was largely smoothed out. The course winded around continuously, with lots of quick short climbs and steep, fast downhills that allowed for a great flow and kept you completely captive. This was good fun! 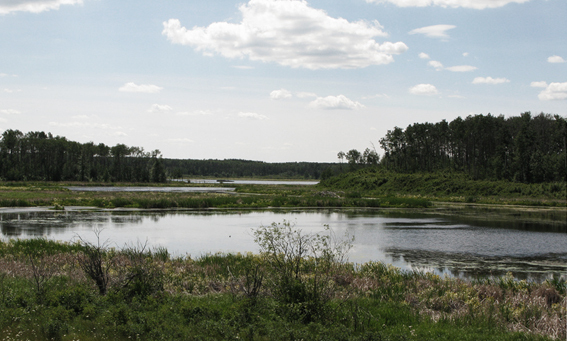 During those first 20km, I even found a second or two to look up and take in some of the beauty of the Blackfoot area, made up of dense dark forest, and a multitude of small lakes and wetlands. At the first turn-around point at 21km, where the racers were doubling back on each other for the first time, I saw a lot of familiar faces just ahead of me, like Todd Smart from the ol’ RVC team. It was motivating to know I was hanging in there just behind these guys. As it turned out, Ken was just in front of them at that point as well, though I didn’t know that at the time. Somewhere around the 25km mark, I hooked up with Niels Van Ommeren, from Cyclemeisters out of Calgary. 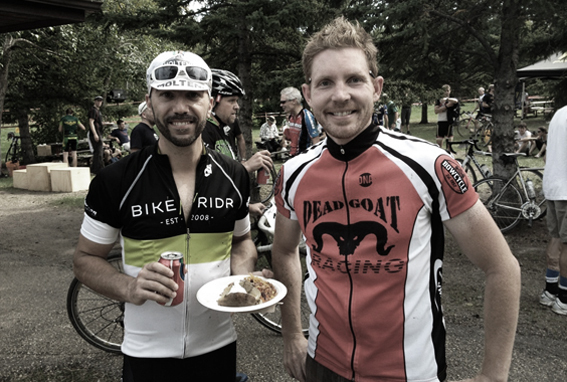 A few years back, he and I both podiumed at the MTB XC Nationals in Canmore, so it was cool to be able to race with him again. Unfortunately, the course started to take its toll on Niels by this point, wreaking havoc with his lower back. He wasn’t the only one, though. Most racers, whether you were passing them, or they were passing you, took a moment to grumble something about the agony they were grinning through. But, still on lap 1 of 2, this was just the start of the real suffering. For me, I was still feeling pretty good – legs and lungs felt strong as I just hammered along. The only mechanical issue I was having was that my seat had slid back on me, tilting up, so I spent most of the last 10km riding out of the saddle, wanting to wait until I got to the 37km mark feed zone to fix it. When I got there, Niels came up to see how I was coming with the seat and to let me know he was cutting his losses, both his back and knee were angry enough. It was also right then that I was surprised by Ken, who ran up asking for Duct Tape. He’d forgotten his gloves, and his hands were being chewed up like raw hamburger. I didn’t have any, but offered my gloves. Ken, being the ‘hardman’ he is, declined and rode out gnashing his teeth while I finished getting my seat set up again and took in some food and fluids. Back out on the trails for lap 2, I still felt reasonably good. I was motivated to catch Ken, thinking he was only 5-6 mins ahead. I hammered for a few km, but my seat slipped again, causing yet another delay and a few colourful expletives. Once that was fixed, I was back hammering my way along, but sadly all good things come to an end… At about the 9km mark on lap 2, on an unassuming short, steep uphill I felt both my quads start to cramp right above the knee. I’ve never had this happen before, so I didn’t know what to think at first. I let off the gas right away, and allowed the muscles to relax. As I pedaled on I figured, ‘Uh… Oh…’ I started chugging the Gatorade I had with me. I’d only taken in one bottle on the first lap, and now it was getting really hot out. I could feel the sweat streaming down the sides of my face and the back of my neck. I also sucked back a quick gel, which really is an amazing bit of nutritive science! They make you feel great, almost immediately, but just not for long. It helped me get through the next 10km or so, but soon I was back to cramping, and harder than before. At the top of one climb I let my left leg straighten just a bit too much and it cramped so hard I had to grit my teeth and push back through the pedal stroke to get it to release. It was like the worst Charlie Horse cramp I’d ever felt! By the time I arrived back at the 21km turnaround checkpoint, I couldn’t put any power into climbs, at all – or risk that my quads would just seize! I was out of water now totally, when I stopped at the 21km checkpoint to fill up my bottle, and I had to sort of half squat as I stood and filled the bottle. I didn’t want to risk straightening my legs! Back on the bike though, as long as I kept them turning over, and didn’t put the power down, thankfully they behaved themselves for me, so I pressed on as racer, after racer passed me by. Looking back, maybe I should have stopped. Obviously, you’re not in a ‘good’ state if you’re cramping. But, I couldn’t help it. The thought of stopping, and cramping up in a crumpled ball far from the start/finish area was not appealing at all, and with the dry trail conditions, I’d logged a first lap time of about 1:40 which was a lot faster than I’d planned, so in my mind, it wasn’t going to be ‘that’ hard to roll out the last 16km – so yeah, I just kept going, chugging my water and sucking back two more gels to help me get it home. As hard a time as I was having though, I wasn’t suffering as badly as some. Even at my slowed pace, I managed to pass quite a few racers who were dogging it out, or resting at the trailside. In a twisted sort of way, and maybe only cyclists will get this, but knowing you’re all hurting together, makes it easier to suffer through your own race. So, by the 30km mark of lap 2, when I was suddenly starting to feel like puking, now obviously from dehydration (or maybe the gels), I pressed on trying to keep pace with the rag-tag crew of racers I was suffering my way to the finish along with… Good times. Fortunately, the cramps only lasted for about 2 mins, and then subsided as the muscles relaxed, and by the time the medics got to me, I was already back up on my feet and standing. They talked with me for a bit about it though, and confirmed what I already knew – dehydration, and lack of electrolytes, so salt and potassium. Word to the wise, stay on your electrolyte and fluid intake boys and girls… Thinking back, I did find it a little odd that I cramped at all, though. I was well-hydrated going into that race, or so I thought… And I’d been drinking Gatorade on the first lap, although maybe one bottle wasn’t enough. Part of me thinks I was still suffering a bit from the Flu… Hard to say, so I guess I’ll never know. All in, this was a great race concept, and I tip my cap to Fiera Race Club and all the organizers who came up with it, and to the volunteers who made it such a fun event for the racers. I heard a lot of positive feedback talking with people after the race. The course was fun and well-marked for both direction and distance (nice touch). It all felt really well organized, with lots of checkpoints, cheery volunteers, the post-race meal being hot and ready, the podiums happening right away, and pre-drawn draw prizing – all really, really good stuff! People had a good time. Thanks too, to all the members of Team Bikeridr – Ken, Jason, Sarns and Nichole who as a first-time racer, boldly tossed her hat in the ring to help us submit a complete team. Though, in the end, we were DQ’d when Nichole wasn’t able complete the aggressive Full-Kettle course, it was great that we got a full team together at all, and take a run at that category, as well as in our own solo category efforts. As per usual, Ken beat me in. Though it was close. Sigh… I swear, one day I’m going to be faster than you, haha… Kudos to Jason for putting in a fast finish as well, and to Sarns for his stellar 5th place! Team Bikeridr will be back in 2013! And now that my legs have stopped cramping, I’m actually looking forward to it. Sheldon’s ride sounds like the “lite” version of what I went through – knarly! But having finished it I am definitely coming back for redemption next year! Great report Sheldon! I wasn’t sure whether to expect a conclusion of “I’m never doing that again” or “That was the best thing ever”. Glad to hear you’re keen for 2013. As you know, I had my share of cramping issues out there too. I feel your pain. Thanks again for coming out you guys!